In quiet, leafy suburbia – Oatley, Sydney – Edmonds & Greer sits contentedly on the corner of Mulga Street & Mi Mi Street. A friend introduced me to this Home Decor – Gift Shop – Cafe a few years ago for a coffee & treat. I’ve been back a few times since for brunch and shopping, and most recently with my little Freya to try lunch on a Sunday. It’s very busy on the weekends especially for breakfast and brunch, so I recommend early arrival or even call ahead to reserve a table. They have both outdoor & indoor seating, and there are 3 sub-rooms in the cafe offering tables for parties of 5 to 8. It is a casual cafe which has good fare. The menu is not big (which I like) and offers some appealing meals. * All the assortment of sandwiches. 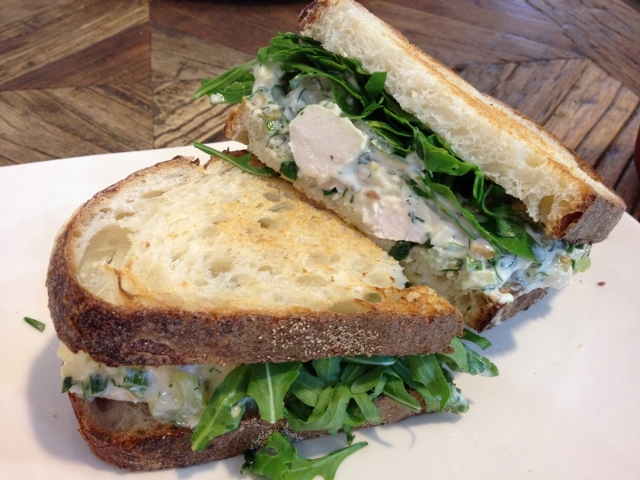 I sampled the Poached chicken breast tumbled in a fresh herb & lemon mayo with celery, slivered almonds & rocket on toasted white sourdough for $12.50. The addition of the celery and slivered almonds were texture & flavour winners for me. * Slow braised shredded lamb shoulder with a salad of beetroot, lentils, roast carrots, Perisan feta, pepitas, rocket and sherry vinaigrette $22. * Duck filled ravioli with a mushroom chasseur sauce (a French brown sauce), wilted spinach & toasted crushed pistachios $23. They also have a specials board which changes weekly. For the kiddies they offer a $10 deal – Ham & cheese mini roll with a kid’s size milkshake & choice of cupcake or scoop of ice cream. Freya had this and the mini roll was a tasty Italian panino cut in half. 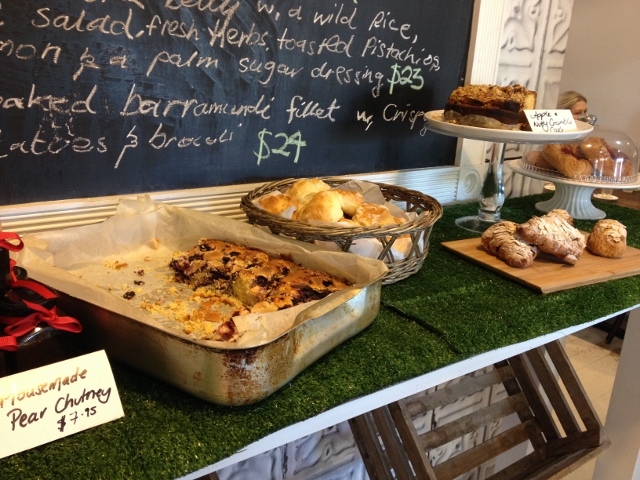 They have a tantalizing rustic dessert table with in-house made luscious sweets. I was able to fit in a coffee and a treat this round – a cinnamon scroll – so yummy. The service was rushed and not very attentive. Enough said there! crowds). The decor assists in creating this mood with pale creams & French country chic furnishings. The Home Decor & Gift Shop attached to the cafe is a lovely diversion after your brekkie or lunch – filled with many impulse purchase items.